Chinese New Year is the best season to get Mandarin Oranges in cheap prices \o/. Pergi Tesco nampak limau, pergi Giant pun nampak limau. Heaven. I made this a while ago using both dark and white chocolates. Get rid of the latter if you want to keep this recipe healthy. I sprinkled my slices lightly with coaster salt and unsweetened shredded coconuts on top of my dark chocolate. Meanwhile, my Mandarin dipped with white chocolate was slightly a fail (IMO), I tried to make the white colour looked vibrant but mine was like, totally washed out and it didn't turned out like what I wanted it to be. So I added a spoon of nutella, whoops, don't judge ;P Nevertheless, both tasted good! so okay what- haha. Later I discovered that the white chocolate needs to be slightly cold before dipping in the Mandarin slices - hence you will get a nice white colour. The recipe is flexible. Topping is really up to you, and actually, the fruits too. Strawberry Chocolate common sangat, cer try lain sikit, hehe. - Line a baking tray with parchment paper. Take a handful of chocolate and melt them in the microwave until they completely soft or use a double boiler. I just microwaved them with 30 seconds intervals. 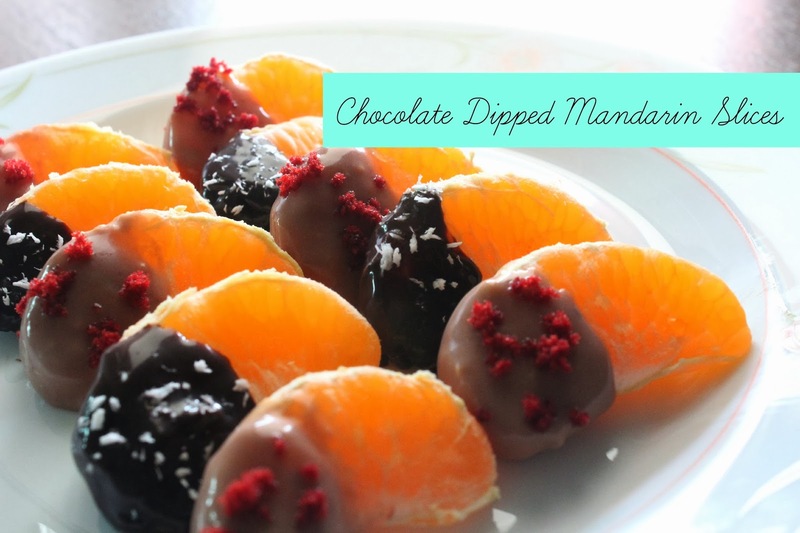 - Then, dip Mandarin segments into melted chocolate and align them on the tray. While the chocolate still wet, immediately sprinkle with a few grains of salt. - Once all pieces are dipped, leave them inside the freezer to chill for at least 15 minutes or until the chocolates harden. macam sedap je, macam sedap je..